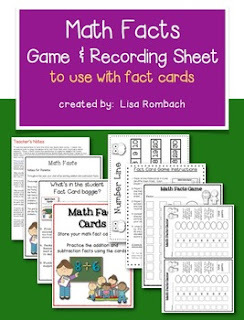 Motivate your students to practice their basic addition and subtraction facts with this fact card game and recording sheet! Teacher’s Notes page describing how I use the materials in the file. What’s in the Student Fact baggie (a list of the materials I include in the baggies students take home). Notes for Parents (where I describe the importance of learning math facts). Cover Page (which I copy on cardstock and slide into the student baggie). Instruction sheet (describing how to play the math fact game). Full Page recording sheet for math fact game. Half Sized Page recording sheet for math fact game (2 recording sheets on a page). Number Line sheet (1-30) for students to use as a strategy to solve the facts OR for checking answers. I have always made sheets of fact cards for my students to take home (hoping they would use them for practice). However, I found that just sending the cards home wasn’t enough. Now they have a fun game to play and a way to practice their facts! NOTE: ****Fact cards are NOT included in this file. The materials can be used with any fact unit or with multiple fact units. Some math programs include consumable fact cards and there are many free fact card printables available on the internet! They need to be the kind with NO answers on the back to use with this file.